The Irish economy might be in dire straits at the moment but hasn't deterred Rua Meegan and Laurenn Teeling who have just compiled Irelands first Street Art book. 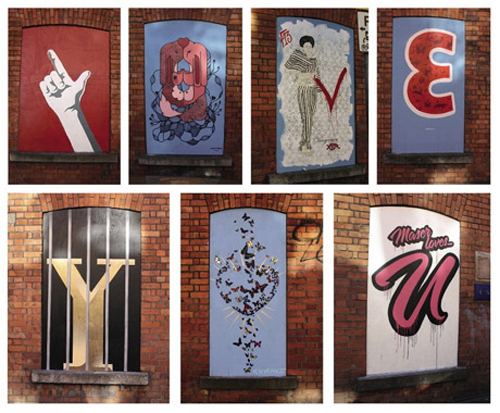 A Visual Feast — Irish Street Art was launched last Thursday night in Dublin's Bernard Shaw bar. The new book is a photographic collection from the streets of Ireland featuring the work of and comments from Irish artists ADW, Asbestos, The Bogside Artists, Canvaz, Conor Harrington, Conor Casby, Fink, Gene, Lamps, Karma, Loki Demonseed, Maser, Vango, Will St. Leger, Xπr & many more. Also featured are pieces painted in Ireland by international artists such as D*Face, Eelus, Eine, El Mac, ESPO, Jef Aerosol, Lints, Luca Molente, Orticanoodles & Rugman. The book is available in selected outlets in Ireland and via the Visual Feast website for EURO—19.99.